Save on your next flight from XGR to LBB when you book through Travelocity. Need a last-minute flight to Lubbock? Travelocity offers discount airfare no matter when you book, even on popular routes such as Kangiqsualujjuaq Airport to Preston Smith Intl. Airport. Whether you need a direct or indirect flight, you can trust Travelocity to provide you with the best prices for XGR to LBB flights. Situated in Lubbock, this motel is within 2 mi (3 km) of Prairie Dog Town, Meadowbrook Golf Course, and Louise Hopkins Underwood Center for the Arts. Joyland Amusement Park and Mackenzie Park are also within 3 mi (5 km). Situated in Lubbock, this hotel is within 2 mi (3 km) of Jones AT&T Stadium, Texas Tech University, and University Medical Center. City Bank Coliseum and Vietnam Archives at Texas Tech are also within 1 mi (2 km). 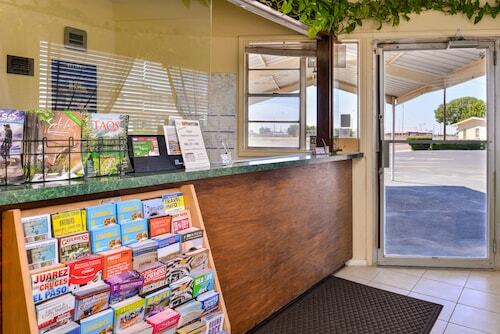 Situated near the airport, this motel is 0.5 mi (0.8 km) from Louise Hopkins Underwood Center for the Arts and within 3 mi (5 km) of Texas Tech University and University Medical Center. Carlock Building and McPherson Cellars Winery are also within 1 mi (2 km).